Ryan & I on the river walk. We just got there and were on our way to meet up with Kara and her husband, Matt. I found a little nest of baby ducks that I had to take a picture of. The mother duck had her watchful eye on me. Once we met up, we had some good Mexican food for lunch. It was nice because the restaurant opened up to the river walk, so we had a nice view. 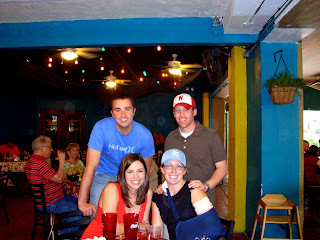 Oh, and you may be wondering why Kara has an arm sling on. Well... it's a long story that involved a thirteen year old peer pressuring Kara to jump from a trampoline to a wooden pole underneath a deck. She tried to swing from it but ended up falling on her back against a cement floor and shattered her left elbow. The injuries were so serious that she had to have surgery and she now has a metal piece where the end of her radius bone should be. That's my best friend for you! Always has to make a scene. I'm just joking.... sort of. :oP She was a total trooper the whole trip. Can you imagine lugging around a ginormous, bandaged arm all weekend? Her surgery was on Wednesday and she flew to San Antonio Friday. She wasn't about to miss out on a fun weekend, broken elbow or not. This past Monday she was able to get the big bandage removed. Hopefully that helps with mobility and strain on the neck. She has a long road of recovery a head of her. Sheesh. We did a little window shopping. You can tell the boys really got into it. 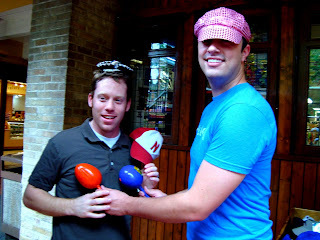 Ryan wanted that pink, sparkly hat so bad I had to pry it out of his hands! 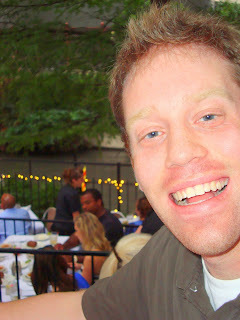 A picture on the river walk right before dinner. Kara's parents treated us to a very nice dinner at a steak house. It was right on the water and so beautiful when it got dark and all the lights lite up. You might be questioning why I took a close up shot of Matt, but if you look past the diversion of Matt you will see someone behind him. It was Carlton from Fresh Prince of Bel-Air played by Alfonso Ribeiro! It's hard to tell in these pictures, but it was totally him. He's put on a little weight. That didn't matter because he was having dinner with FOUR women! I guess he still has game. Look closely, it's him! 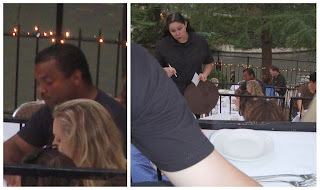 This was my first experience of seeing a celebrity in real life! I have met Jay Leno but that's a whole nother story. The next morning we got up to have breakfast with Kara and her fam before they headed back. I miss you already my gimpy armed friend! After we said our goodbyes, Ryan & I realized we still had a full day left in San Antonio. What better way to spend that time then at Six Flags! We hadn't been to a theme park in a long time and never to one in Texas. It ended up being the perfect time to go because it was a Sunday morning, right when it opened and of course the scare of swine flu kept people away. There were no lines! This was a benefit but I think there is a reason to wait in lines so that you can recover before the next ride. We had a blast! 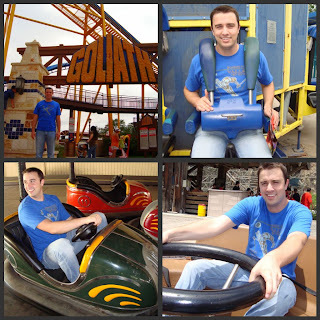 Ryan really enjoyed the rides you could steer. The picture below was taken right after being splashed in the face from the water ride behind us. Ryan said he forgot to close his mouth and got a mouth full of the theme park water... ugg. 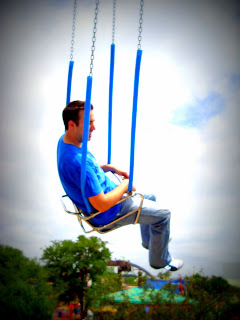 I really wanted to get a picture of Ryan on the swing ride because I thought it would look cool. It turned out pretty good but Ryan was very motion sick after that. Ooops! We ended the day by changing into our swimsuits and going to the water park section. It was a fun filled weekend that left me sunburned and so happy to have spent time with my best friend, her family and my hubby. Hey...I noticed that you follow "Kelly's Korner", too...where are the pictures of your house??!!! :) From the few pictures I have seen on your blog...you have a beautiful home and I would love to see more!!! A friend at work showed me Kelly's blog and I've been reading it ever since. Harper is a doll!!! Thanks...but no, I'm not an interior decorator. :) I know what I like and what I don't like...but it usually takes me a while to put things together. At first, I had a lot of help from my mother-in-law (she is AWESOME at decorating), but just recently started trusting my own taste!! I don't think you have anything to be self conscious about...the few pics. I have seen are great! Can't wait to see more! But please don't feel obligated to show more...I'm just being nosy, lol! Hope you guys have a great weekend!